Hacking of Facebook Accounts is a very common problem in these days. All these are happening because of our little mistakes. In this post I can write about how your friends, family members and co-workers are hacking your facebook accounts, and how to make safe and protect yourself from being hacked by your friends and family members. Note: Never use following steps to hack anybody's account. This post is educational and only to make aware people about how to secure yourself from being hacked on facebook. Steps used by hackers to hack your facebook account. How to Secure Yourself from these type of hackers. So let me now come to the point and discuss about the steps used by friends or by hackers to hack facebook accounts. First of all hacker visit your profile and copy your profile link to steal your username. Profile link is shown in below image. Look carefully to link, and observe https://www.facebook.com/kumarsluck. 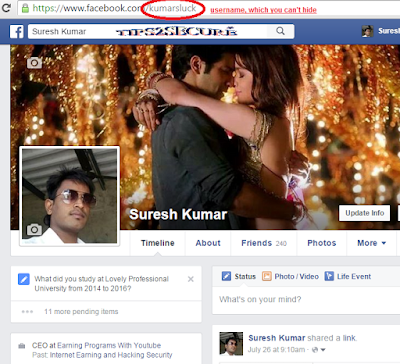 In link kumarsluck is my username of facebook profile. So after getting username user don't need to your facebook email to hack. How? ... Read in second point. Now hacker use your username in forget password section, and facebook give him a hint of email address by showing first and last digit of email address. If the hacker is professional then he only use your username to hack your account by using some hacking software or by inspecting element. Sometimes they use source code to steal information from your account or sometimes they simply note secured links by facebook shown in source code and later they block that links to find out the information. To check source code your facebook profile or any site is very simple. You can do this just by Pressing CTRL+U from your computer for any site or webpage. And for inspecting elements just your cursor to place on site to inspect and then do right click and select 'inspect element' option. It shows the elements and combination of that particular link or gadget. But if hacker is your friend or from family members then there may be chance that they might know your password of gmail accounts, or you may also left your gmail account without making sign out on shared PC. And this is the biggest mistake done by you to let your facebook accounts be hacked by hackers or friends. Make Safe Your Gmail Account by using difficult password to login. In next step they simply put their email address on forget password page by facebook. Then facebook send a link to reset the password in gmail account. Check Security Holes in Gmail to protect your data from hackers. After resetting the facebook account, you account got a new password provided by hacker. These type of hackers always delete emails from gmail to show like the account is hacked by professional hackers. But in some cases they also forget to remove message from email trash. So if something is going to happen with you in future, then never forget to check your trash in your email account if you are using Gmail as email account. Because in that link for resetting passwords there is also a link to revert the whole process and gaining access to your facebook account by using old password. Always make sure to logout both facebook and gmail accounts after use. Never use same passwords for both accounts. If you've have a fear to forget password then use a secret diary to remember passwords. Never click on links by third party because that links may be from phishing attacks. Phishing is a process used by hackers to steal your login and password. Hackers may send you a link by making false promises and statement. But when you click on that link, you can see a new fresh page of facebook asking you to login in your account. Here is the trick because that site looking like facebook is not a real facebook site, but who don't know about these attacks are easily trapped in this game, and fill their login Id/Password. Then after it shows thanking message or error message. But your login information is already reached to hacker just because of your this mistake. Lolzz how funny and interesting na?? Avoid to clicking on links. But if you want to open that link no problem because every link is not spam or for phishing purpose. Some links may be useful for us. 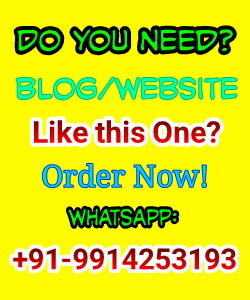 So we should always check in address bar that the url is must be from Facebook.com or https://www.facebook.com. Just close the page if they are asking to enter Id/Password manually to login. Message: Thanks for reading "How To Secure Your Facebook Account From Being Hacked By Your Friends (Hacking Security)". Please share this information with your friends also by using our social sharing buttons given below.